The caravan is double glazed with gas central heating. Lounge comprises of large sofa and two chairs. There is a 28" TV, DVD player and DVD'S plus a sky box. Dining Room is on a raised platform with a table and four chairs. Master Bedroom has a double bed, ample wardrobes, Built in TV cupboard with a 15" TV/DVD,dressing table and hairdryer. Ensuite comprising of bath, overhead shower, toilet and vanity sink. 2nd bedroom comprising of 2 single beds, overhead cupboards and wardrobe with 15" plasma TV..
Main bathroom has a shower, toilet and vanity sink. Kitchen has a full sized fridge and freezer, microwave, toaster gas oven and hob. Ironing board and iron. Duvets and pillows are provided but not bed linen. 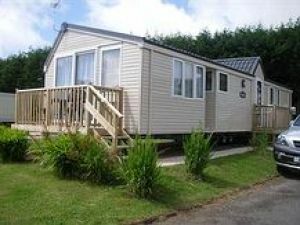 There is ample parking outside the caravan with a patio area to the side with table and chairs plus decking area which is reached from patio doors from front of caravan. PENALLY COURT is the sister site of Kiln Park. Penally is a peaceful and relaxing site which has a shop, launderette, heated outdoor pool and a large playing field and childrens park. There is also free transport on demand to and from Kiln Park. This listing for a privately owned static caravan rental has been viewed 20355 times.